This is my second favorite snack. It's tied with Chick-Fil-A chicken nuggets. You might argue that nuggets are technically a "meal." 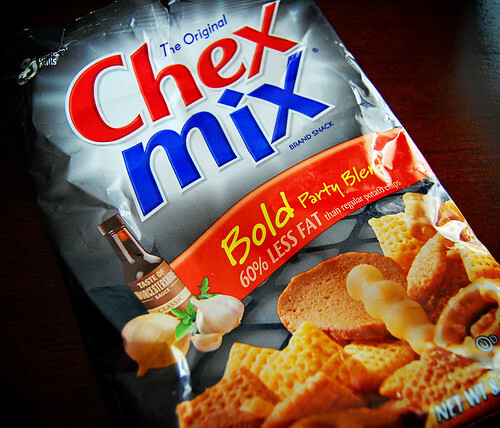 Everything in the Chex Mix does not make the digestive cut. I used this candy dish to toss the wasteland that is pretzels. 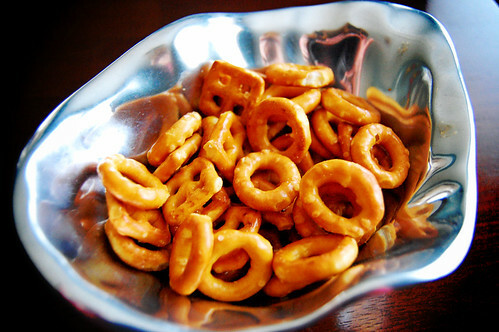 If you're reading this and honestly like pretzels, raise your hand. I like pretzels if they're covered in chocolate, but then I'll eat pretty much anything if it's covered in chocolate. p-b: That sounds like you throwing down a gauntlet? WAI: Chex should hire your mom. Or I should. I have a suggestion! You can send me the pretzels from your Chex Mix and I'll send you the nasty Rye slice things from mine. Those things make me angry at my mouth if I eat them. adore the rye chips. I demand you move here immediately.